Each product page contains photos and press release text pertaining specifically to that product; if you’re interested in written copy only, browse the press release archive index. Amsterdam, NY (September 14, 2016) – Mohawk Lifts announces the release of a new accessory to service cars, trucks, zero turn mowers, turf equipment and four wheelers. The turf kit with dual trough has a 6,000 lb. capacity and can be used on Mohawk 10,000 through 18,000 pound two post lifts, including those lift models with optional three stage arms. The dual trough gives versatility to shops and facilities that need to service cars, pick-up trucks, as well as turf equipment without having to dedicate a service bay and lift to just one type of equipment. For additional information, contact Mohawk at 800-833-2006 or www.mohawklifts.com. Staples, MN (July 21, 2015)– The National Joint Powers Alliance (NJPA) recently re-awarded Mohawk Lifts a nationwide 5 year contract to supply government agencies across the U.S. with Mohawk vehicle lifts. In addition to Mohawk Lifts, the contract also offers Hunter Engineering wheel service equipment, Westmatic vehicle washes, Samson lubrication equipment, Gray Manufacturing jacks, Trans Tool automotive transmission repair tools, John Dow Eurovent vehicle exhaust extraction systems and Vidmar/Lista (Stanley Company) who provides heavy duty storage solutions. For more information about Mohawk’s contract or how to join NJPA, please visit www.govlifts.com. NJPA’s cooperative contract purchasing leverages the national purchasing power of more than 50,000 member agencies while also streamlining the required purchasing process. Amsterdam, NY (Jan 24, 2014) – Mohawk Lifts has announced the release of a new blog site that will cover auto lift news, garage equipment reviews, vehicle lift safety, common auto lift questions and much more. With contributions from industry experts, the site will be a resource for individuals researching lifts for their home garages, owners of general repair shops, and fleet managers who may be looking to outfit his or her maintenance facility. To access the site, visit www.autoliftmag.com and subscribe to get the latest news and blog posts via email. Mohawk Lifts, the leader in lift technology, introduces the Backsaver for all Mohawk 10,000 lb. to 18,000 lb. two post lifts. The Backsaver allows technicians to hang tires from lift swing arms, saving them from having to bend down to lift heavy tires and preventing potential sick days or workers’ compensation claims from back pain. The Backsaver is easily installed in ten minutes and with a 100 lb. capacity is capable of holding the heaviest passenger car and light truck tires. Heavy rubber coating on the Backsaver prevents damage to expensive wheels and rims. For more information call 800-833-2006 or visit www.mohawklifts.com. Mohawk Lifts, manufacturer of above ground vehicle lifts ranging from 6,000 to 240,000 lbs., has just launched a mobile version of the Mohawk Lifts website. The mobile websites provides customers with the same information as the regular Mohawk Lifts site and has been optimized for browsing without a mouse and keyboard. 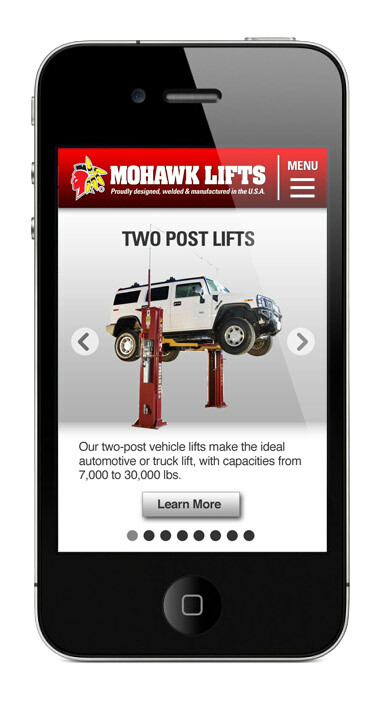 The mobile site will automatically display when www.mohawklifts.com is accessed from a mobile device. Custom track lengths are now available on all Mohawk TR-19s up to 20 feet in length and TR-25s up to 30 feet in length. Custom lengths are important to those with limited shop space available or particular vehicles in need of repairs. If you are interested in a TR-19 or TR-25 with a custom length please contact Mohawk Lifts at 800-833-2006. All Mohawk lifts are designed and manufactured in the U.S.A. For more information please visit www.mohawklifts.com. Mohawk’s new brochure show the TL-7’s adjustable lifting forks that accommodate all ranges of wheelbases & tires, the twin safety locking systems & hydraulic locking safety . Mohawk’s lift now features a 25 year structural/10 year mechanical warranty. Mohawk’s TL-7 is proudly designed, welded, and manufactured in the U.S.A.
All Frame Contact Lifts Must Have A System To Accommodate Lifting Of Low Riding Passenger Cars, As Well As High Frame Trucks, Vans&Sport Utility Vehicles (Suv’s). There Are Three Different Styles Of Arm/Arm Adaptors Used In The Lift Industry To Accommodate All Vehicles. The High Height For Access Under Low Riding Cars, The Set Up Time To Properly Position The Pads, The Small Surface Area Of Contact Lessens The Stability, And Frequently These Flip Pads Don’t Go High Enough For Some High Frame Vehicles. This Final Disadvantage Can Be Overcome By Purchasing Optional Pad Extenders. The Second Style Is The Screw Adjustment Lifting Pad. Advantages Of Screw Pads Are They Are Self Contained, And Give A Large Stable Surface Area Contacting The Vehicle. The Disadvantages Are; Screw Pads When Fully Extended Still Don’t Reach All Truck Frames Requiring Optional Extenders, A High Profile When Fully Lowered And Finally A Shop That Must Change The Height Of These Pads Just 3 Times Per Day Between Cars And Trucks, Based On A $40 Shop Rate Will Waste $2000 A Year In Lost Repair Time & Productivity Costs. Finally The Third Style “Quick-Connect” Stacking Adaptor System Offers Infinite Height Adjustment For High Frame Trucks, Are Easily Positioned, Offer A Large Frame Contact Area, Take Less Than 30 Seconds To Change The Lifting Height Between Cars & Trucks, And Is Low Enough For All Low Riding Cars. Blind Note To Editorial Dept. $2000/Year Saving Based On #1 Changing The Heights 3x/Day (Which Isn’t Much) =15 Minutes #2 $40 Shop Rate #3 200 Working Days/Year Therefore— 15 Minutes/Day X $40 Shop Rate = $10 Day— $10/Day X 200 Days Per Year =$2000. The Above Scenario Is Not Mohawk Lift Specific, And Several Lift Companies Use The Same Time Saving Quick Connect Adaptor System That Mohawk Does. Therefore Nobody Can Give You Grief For Picking Up The Above Release Or Being Biased. The HR-6 is a portable lift, easily moved from bay to bay, and operates with 110-volt electric or hydraulic power. The HR-6 gives full 360-degree access around the lift. Perfect for tire, brake and body shop work. The HR-6 lift is operated on any level surface without being bolted down. The HR-6 operates with tow hydraulic cylinders, multiple position mechanical safety locks and hydraulic safely systems. Mohawk’s A-7 model is an asymmetric two post lift with a 7,000 lb. lifting capacity. This asymmetric design allows Mohawk’s A-7 lift to fit in narrow 10′ wide bays while all vehicle doors are fully opened. The A-7 features a clear floor work area designed for free and easy access around your shop. The A-7 offers height adjustable overhead steel hydraulic lines to easily fit your shop’s ceiling height or optional underground lines. The A-7 lift is equipped with Mohawk’s patented hydraulic synchronization system and infinite position mechanical locks which are backed by redundant hydraulic safety systems. Standard features of the A-7 include; low 3 ½” swing arms for access under the lowest riding sports cars, and both 3″ and 6″ truck frame adaptors for hard to reach vehicle frames. Automatic swing arm restraints assure vehicle security and safety. All Mohawk Lifts are designed and manufactured in the USA. Mohawk’s A-7 lift is ALI/ETL certified to meet the one and only National Safety Standard for garage lifts. Mohawk’s A-7 lift comes with a 25 year structural, 10 year mechanical, plus a limited lifetime hydraulic cylinder warranty. For more information please visit www.mohawklifts.com, call 1-800-833-2006, fax 518-842-1289, or write to P.O. Box 110, Amsterdam, NY 12010. Mohawk lifts SPEEDLANE drive on adaptor is available for 9,000 to 16,000 capacity 2 post lifts. Mohawk Lifts SPEEDLANE is a drive on adaptor for a two post lift to quickly convert the frame engaging swing arm lift into a drive on pad lift to leave the wheels hanging free for tire, brake, and under vehicle service work. The SPEEDLANE can be added or removed in 10 seconds and it is an ALI/ETL certified option. For additional information please visit www.mohawklifts.com or call 1-800-833-2006, or fax us at 518-842-1289. Write us at PO Box 110, Amsterdam, New York 12010. 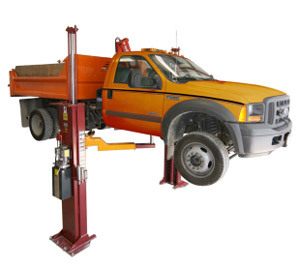 Mohawk Lifts SPEEDLANE is a drive on adaptor for a two post lift to quickly convert the frame engaging swing arm lift into a drive on pad lift to leave the wheels hanging free for tire, brake and undervehicle service work. Made of lightweight aluminum the 90 lb. SPEEDLANE fits into place or is removed in just seconds per side.The SPEEDLANE does not reduce the capacity of the lift it is being used on. The SPEEDLANE eliminates the set up time of using a two post lifts swing arms essentially changing the swing arm lift into a wheels free ramp lift (and back again). The SPEEDLANE works on all Mohawk 9,000, 10,000 12,000 and 15,000 lb. capacity twin post lifts. Mohawks TL-7 two post, turf lift is a 7,000 lb. capacity lift made specifically for various types of turf maintenance equipment. Equipped with adjustable lifting forks to accomodate all ranges of wheelbases, the lift forks also expand and contract to handle different size tires. The rear of the vehicle is riased with the wheels in a trough which gives the Mohawk TL-7 turf lift the flexibility to accomodate so many different pieces of equipment. Offering a full 6′ lifting height, twin safety locking systems&hydraulic locking safties. The TL-7 lift comes with a 25 year structural, 10 year mechanical, plus a limited lifetime hydraulic cylinder warranty. Adaptor makes frame engaging lift into tire engaging lift Mohawk lifts introduces the wa-1&wa-12 wheel adaptor. By quickly changing from frame contact to wheel contact,the Mohawk adaptors make lifting vehicles easier, safer & faster by speeding up the “set-up” time of frame contact lifts. The WA-1 & WA-12 adaptors fit all Mohawk 9,000, 12,000 and 15,000 lb. capacity two post frame contact lifts. The adaptors are quickly bolted onto the lifts swing arm, or remove just as quickly to revert to a typical frame contact lifts for when “wheels-free” service is required. Mohawk lifts introduces high-rise tire dolly. The TD-1000 tire dolly is a 1,000 lb. capacity tire dolly, able to raise full sized dually tires a full 48” for tire removal&installation with all heavy duty truck tires in conjunction with any truck lift. The winch operated design incorporates a side-shifting ability of the lifting rollers allowing easier alignments of the tire to the bolt pattern, rollers on the lifting forks to rotate the tire to the bolt pattern and hydraulically tilting forks to assist in lug nut realignment. Mohawk Lifts introduces the USL-6000. The universal scissors lift (USL-6000) is a 6,000 lb. capacity full rise, no-post, portable lift giving shops full side&under-vehicle access. The USL-6000 features all the benefits of low & mid-rise lifts but also gives full 6’ lifting height for approximately the same price. Mohawk lifts model TR-25 has a capacity rating of 25,000 lbs. The TR-25 will accommodate trucks, buses, utility vehicles, and all passenger cars. The TR-25 offers a full 6’ of unrestricted undervehicle access. Equipped with 20′ to 35′ runways, with available equipment including “wheels free” rolling jacks to raise the tires off the tracks for wheel, brake and axle service. Powered by a 2 h.p. Electric motor and pump, TR-25 safeties include infinite position mechanical locking wedge, Mohawks patented hydraulic safety systems, leaf chain synchronization and redundant electronic controls. The TR-25 is easily installed in just six hours. The surface mounted design avoids all the environmental liabilities associated with below ground lifts. Mohawk lifts introduces the model TR-19 with a capacity rating of 19,000 lbs. The TR-19 will accommodate all passenger cars trucks, utility vehicles, small R.V.’s. The TR-19 offers a full 6’ of unrestricted undervehicle access. Equipped with 20′ runways,&available “wheels free” rolling jacks to raise the tires off the tracks for wheel, brake and axle service. Powered by a 2 h.p. Electric motor and pump, TR-19 safeties include infinite position mechanical locking wedge, Mohawks patented hydraulic safety systems, leaf chain synchronization and redundant electronic controls. The TR-19 is easily installed in 4 to 6 hours. The surface mounted design avoids all the environmental liabilities associated with below ground lifts. Mohawk’s TP 26 was the first two post frame contact lift made to suit the needs of heavy duty fleets. The TP 26 is an above ground clear floor style lift with a full six foot lifting height and 26,000 lb. lifting capacity. The TP 26/30 lifts are both heavy duty lifts, clear floor designs with either a 26,000 or 30,000 lb. lifting capacity. These heavy duty two post lifts are hydraulically equalized, using a pair of height adjustable overhead hydraulic lines for all types of trucks and utility vehicles (optional underground lines available). The TP 26/30 lift has a 5” low profile, double telescoping arms that allow access under all passenger cars. Standard equipment includes 5”, 7 ½” and 10” stacking truck adaptors. The state of the art safety systems include; dual all position mechanical safety locks, Mohawk’s patented hydraulic system, hand-held pendant control to raise or lower the lift, velocity fuses and pressure compensated flow valve control. Automatic locking swing arm restraints engage from the moment the lifts start to rise. All Mohawk Lifts are designed and manufactured in the USA. Mohawk’s TP-26/30 lift is ALI/ETL certified to meet the one and only National Safety Standard for garage lifts. Mohawk’s TP-26/30 lift comes with a 25 year structural, 10 year mechanical, plus a limited lifetime hydraulic cylinder warranty. For more information please visit www.mohawklifts.com, call 1-800-833-2006, fax 518-842-1289, or write to P.O. Box 110, Amsterdam, NY 12010. Mohawk’s TP-16 is a clear floor above ground lift capable of raising medium duty vehicles up to 16,000 lbs. The TP-16 electric/hydraulic lift features Mohawk’s all-position mechanical and hydraulic safeties, total drive-thru design, automatic swing arm restraints and height adjustable overhead hydraulic lines (optional underground lines available). The TP-16 has a twin cylinder direct drive design using no chains or cables. Standard equipment includes 5”, 7 ½” and 10” frame adaptors and features the Mohawk patented hydraulic equalization system. All Mohawk Lifts are designed and manufactured in the USA. Mohawk’s TP-16 lift is ALI/ETL certified to meet the one and only National Safety Standard for garage lifts. Mohawk’s TP-16 lift comes with a 25 year structural, 10 year mechanical, plus a limited lifetime hydraulic cylinder warranty. For more information please visit www.mohawklifts.com, call 1-800-833-2006, fax 518-842-1289, or write to P.O. Box 110, Amsterdam, NY 12010. The LMF-12 features adjustable height overhead hydraulic lines (optional underground lines available), a total drive-thru design and Mohawk’s all-position mechanical and hydraulic safeties. The LMF-12 also comes with 5”, 7 ½” and 10” frame adaptors as standard equipment and features the Mohawk patented hydraulic equalization system. All Mohawk Lifts are designed and manufactured in the USA. Mohawk’s LMF-12 lift is ALI/ETL certified to meet the one and only National Safety Standard for garage lifts. Mohawk’s LMF-12 lift comes with a 25 year structural, 10 year mechanical, plus a limited lifetime hydraulic cylinder warranty. For more information please visit www.mohawklifts.com, call 1-800-833-2006, fax 518-842-1289, or write to P.O. Box 110, Amsterdam, NY 12010. The TP-16 has a twin cylinder direct drive design using no chains or cables. Standard equipment includes 5″, 7 ½” and 10″ frame adaptors and features the Mohawk patented hydraulic equalization system. Mohawk Lifts introduces an updated flyer on the Mohawk A-7 two post vehicle lift. Mohawks A-7 lift flyer shows the lift and all features with comparative photos of other lift brands. Mohawk’s A-7 lifts are made in the USA and are ALI/ETL certified to meet the one and only national safety standard for vehicle lifts. Mohawk’s A-7 model is an asymmetric two post lift with a 7,000 lb. lifting capacity. This asymmetric design allows Mohawk’s A-7 lift to fit in narrow 10’ wide bays while all vehicle doors are fully opened. The A-7 features a clear floor work area designed for free and easy access around your shop. The A-7 offers height adjustable overhead steel hydraulic lines to easily fit your shop’s ceiling height or optional underground lines. The A-7 lift is equipped with Mohawk’s patented hydraulic synchronization system and infinite position mechanical locks which are backed by redundant hydraulic safety systems. Standard features of the A-7 include; low 3 ½” swing arms for access under the lowest riding sports cars, and both 3” and 6” truck frame adaptors for hard to reach vehicle frames. Automatic swing arm restraints assure vehicle security and safety. Mohawk lifts of Amsterdam, NY a leading manufacturer of automotive service lifts announces an update of the model System I. The 10,000 lb capacity, clear floor lift, System I incorporates Mohawk’s patented hydraulic synchronization. The System I is ideal for servicing all cars and light trucks. The System I features a low 3 1/2” arm height allowing easy access to the lowest riding sports cars, total clear floor design with adjustable height overhead hydraulic lines, all position mechanical and hydraulic safeties, and automatic swing arm restraints. Mohawk’s System-1 model is a two post lift with a 10,000 lb. lifting capacity. The System-1 clear floor lift incorporates Mohawk’s patented hydraulic synchronization system. The System-1 lift is ideal for servicing all cars and light trucks. The System-1 features a low 3 ½” swing arm height allowing easy access to the lowest riding sports cars. Mohawk’s System-1 lift design features adjustable height overhead lines (optional underground lines available) and all-position mechanical and hydraulic safeties. Standard equipment includes; 3″ and 6″ truck frame adaptors for hard to reach vehicle frames and automatic swing arm restraints assure vehicle security and safety. All Mohawk Lifts are designed and manufactured in the USA. Mohawk’s System-1 lift is ALI/ETL certified to meet the one and only National Safety Standard for garage lifts. Mohawk’s System-1 lift comes with a 25 year structural, 10 year mechanical, plus a limited lifetime hydraulic cylinder warranty. For more information please visit www.mohawklifts.com, call 1-800-833-2006, fax 518-842-1289, or write to P.O. Box 110, Amsterdam, NY 12010.